She was the aunt of Otto Robert Frisch. Her father was Philipp Meitner. 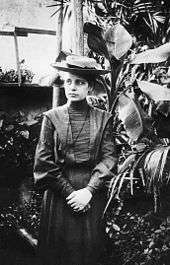 Lise Meitner (7 November 1878 – 27 October 1968) was an Austrian-Swedish physicist who worked on radioactivity and nuclear physics. 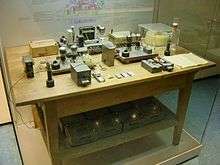 Otto Hahn and Meitner led the small group of scientists who first discovered nuclear fission of uranium when it absorbed an extra neutron; the results were published in early 1939. Meitner and Otto Frisch understood that the fission process, which splits the atomic nucleus of uranium into two smaller nuclei, must be accompanied by an enormous release of energy. This process is the basis of the nuclear weapons that were developed in the U.S. during World War II and used against Japan in 1945. Nuclear fission is also the process exploited by nuclear reactors to generate electricity. Meitner spent most of her scientific career in Berlin, Germany, where she was a physics professor and a department head at the Kaiser Wilhelm Institute; she was the first woman to become a full professor of physics in Germany. She lost these positions in the 1930s because of the anti-Jewish race laws of Nazi Germany, and in 1938 she fled to Sweden, where she lived for many years, ultimately becoming a Swedish citizen. Meitner received many awards and honors late in her life, but she did not share in the 1944 Nobel Prize in Chemistry for nuclear fission that was awarded exclusively to her long-time collaborator Otto Hahn. In the 1990s, the records of the committee that decided on that prize were opened. Based on this information, several scientists and journalists have called her exclusion "unjust", and Meitner has received a flurry of posthumous honors, including the naming of chemical element 109 as meitnerium in 1997. Meitner was born into a Jewish upper-middle-class family as the third of eight children in Vienna, 2nd district (Leopoldstadt). Her father, Philipp Meitner, was one of the first Jewish lawyers in Austria. She was born on 7 November 1878. She shortened her name from Elise to Lise. The birth register of Vienna's Jewish community lists Meitner as being born on 17 November 1878, but all other documents list her date of birth as 7 November, which is what she used. As an adult, she converted to Christianity, following Lutheranism, and was baptized in 1908. After one year of attending Planck's lectures, Meitner became Planck's assistant. During the first years she worked together with chemist Otto Hahn and together with him discovered several new isotopes. In 1909 she presented two papers on beta-radiation. She also, together with Otto Hahn, discovered and developed a physical separation method known as radioactive recoil, in which a daughter nucleus is forcefully ejected from its matrix as it recoils at the moment of decay. In 1912 the research group Hahn–Meitner moved to the newly founded Kaiser-Wilhelm-Institute (KWI) in Berlin-Dahlem, south west in Berlin. She worked without salary as a "guest" in Hahn's department of Radiochemistry. It was not until 1913, at 35 years old and following an offer to go to Prague as associate professor, that she got a permanent position at KWI. In 1922, she discovered the cause of the emission from surfaces of electrons with 'signature' energies, known as the Auger effect. The effect is named for Pierre Victor Auger, a French scientist who independently discovered the effect in 1923. When Adolf Hitler came to power in 1933, Meitner was still acting as head of the physics department of the Kaiser Wilhelm Institute for Chemistry. Although she was protected by her Austrian citizenship, all other Jewish scientists, including her nephew Otto Frisch, Fritz Haber, Leó Szilárd and many other eminent figures, were dismissed or forced to resign from their posts. Most of them emigrated from Germany. Her response was to say nothing and bury herself in her work. After the Anschluss in March 1938, her situation became difficult. On July 13, 1938, Meitner, with the support of Otto Hahn and the help from the Dutch physicists Dirk Coster and Adriaan Fokker, departed for the Netherlands. She was forced to travel under cover to the Dutch border, where Coster persuaded German immigration officers that she had permission to travel to the Netherlands. She reached safety, though without her possessions. Meitner later said that she left Germany forever with 10 marks in her purse. Before she left, Otto Hahn had given her a diamond ring he had inherited from his mother: this was to be used to bribe the frontier guards if required. It was not required, and Meitner's nephew's wife later wore it. An appointment at the University of Groningen did not come through, and with the help of Eva von Bahr and Carl Wilhelm Oseen she went instead to Stockholm, where she took up a post at Manne Siegbahn's laboratory, despite the difficulty caused by Siegbahn's prejudice against women in science. Here she established a working relationship with Niels Bohr, who travelled regularly between Copenhagen and Stockholm. She continued to correspond with Hahn and other German scientists. On occasion of a lecture by Hahn in Niels Bohr's Institute he, Bohr, Meitner and Frisch met in Copenhagen on November 10, 1938. Later they continued to exchange a series of letters. In December Hahn and his assistant Fritz Strassmann performed the difficult experiments which isolated the evidence for nuclear fission at their laboratory in Berlin-Dahlem. The surviving correspondence shows that Hahn recognized that 'fission' was the only explanation for the proof of barium (at first he named the process a 'bursting' of the uranium), but, baffled by this remarkable conclusion, he wrote to Meitner. The possibility that uranium nuclei might break up under neutron bombardment had been suggested years before, notably by Ida Noddack in 1934. However, by employing the existing "liquid-drop" model of the nucleus, Meitner and Frisch, exclusively informed by Hahn in advance, were therefore the first to articulate a theory of how the nucleus of an atom could be split into smaller parts: uranium nuclei had split to form barium and krypton, accompanied by the ejection of several neutrons and a large amount of energy (the latter two products accounting for the loss in mass). She and Frisch had discovered the reason that no stable elements beyond uranium (in atomic number) existed naturally; the electrical repulsion of so many protons overcame the strong nuclear force. Frisch and Meitner also first realized that Einstein's famous equation, E = mc2, explained the source of the tremendous releases of energy in nuclear fission, by the conversion of rest mass into kinetic energy, popularly described as the conversion of mass into energy. Ironically, Meitner was motivated to begin these calculations in order to show that Irene Joliot-Curie's interpretation of some experiments violated the liquid drop model. In their second publication on the evidence of barium (Die Naturwissenschaften, 10 February 1939) Hahn and Strassmann used for the first time the name Uranspaltung (Uranium fission) and predicted the existence and liberation of additional neutrons during the fission process (which was proved later to be a chain reaction by Frédéric Joliot and his team). Lise Meitner and her nephew Otto Frisch were the first who correctly interpreted Hahn's and Strassmann's results as being nuclear fission, a term coined by Frisch, and published their paper in Nature. Frisch confirmed this experimentally on 13 January 1939. These three reports, the first Hahn-Strassmann publication of January 6, 1939, the second Hahn-Strassmann publication of February 10, 1939, and the Frisch-Meitner publication of February 11, 1939, had electrifying effects on the scientific community. Because there was a possibility that fission could be used as a weapon, and since the knowledge was in German hands, Leó Szilárd, Edward Teller, and Eugene Wigner jumped into action, persuading Albert Einstein, a celebrity, to write President Franklin D. Roosevelt a letter of caution. In 1940 Frisch and Rudolf Peierls produced the Frisch–Peierls memorandum, which first set out how an atomic explosion could be generated, and this ultimately led to the establishment in 1942 of the Manhattan Project. Meitner refused an offer to work on the project at Los Alamos, declaring "I will have nothing to do with a bomb!" Meitner said that Hiroshima had come as a surprise to her, and that she was "sorry that the bomb had to be invented." In Sweden, Meitner was first active at Siegbahn's Nobel Institute for Physics, and at the Swedish National Defence Research Institute (FOA) and the Royal Institute of Technology in Stockholm, where she had a laboratory and participated in research on R1, Sweden's first nuclear reactor. In 1947, a personal position was created for Meitner at the University College of Stockholm with the salary of a professor and funding from the Council for Atomic Research. At the time Meitner herself wrote in a letter, "Surely Hahn fully deserved the Nobel Prize for chemistry. There is really no doubt about it. But I believe that Otto Robert Frisch and I contributed something not insignificant to the clarification of the process of uranium fission—how it originates and that it produces so much energy and that was something very remote to Hahn." In a similar vein, Carl Friedrich von Weizsäcker, Lise Meitner's former assistant, later added that Hahn "certainly did deserve this Nobel Prize. He would have deserved it even if he had not made this discovery. But everyone recognized that the splitting of the atomic nucleus merited a Nobel Prize." Otto Robert Frisch, Meitner's collaborator, wrote similarly in a 1955 letter. After the war in the 1950s and 1960s, Lise Meitner again enjoyed visiting Germany and staying with Hahn and his family for several days on different occasions, particularly on March 8, 1959, to celebrate Hahn's 80th birthday in Göttingen, where she addressed recollections in his honour. 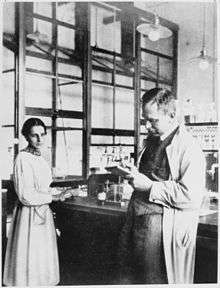 Also Hahn wrote in his memoirs, which were published shortly after his death in 1968, that he and Lise Meitner had remained lifelong close friends. 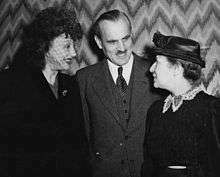 Even though their friendship was full of trials, arguably more so experienced by Meitner, she "never voiced anything but deep affection for Hahn." In 1947, Meitner retired from the Siegbahn institute and started research in a new laboratory that was created specifically for her by the Swedish Atomic Energy Commission at the Royal Institute of Technology. Meitner became a Swedish citizen in 1949. She retired in 1960 and moved to the UK where most of her relatives were, although she continued working part-time and giving lectures. A strenuous trip to the United States in 1964 led to Meitner having a heart attack, from which she spent several months recovering. Her physical and mental condition weakened by atherosclerosis, she was unable to travel to the US to receive the Enrico Fermi prize and relatives had to present it to her. After breaking her hip in a fall and suffering several small strokes in 1967, Meitner made a partial recovery, but eventually was weakened to the point where she moved into a Cambridge nursing home. She died in her sleep on 27 October 1968 at the age of 89. Meitner was not informed of the deaths of Otto Hahn (d. July 1968) or his wife Edith, as her family believed it would be too much for someone so frail. 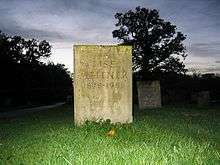 As was her wish, she was buried in the village of Bramley in Hampshire, at St. James parish church, close to her younger brother Walter, who had died in 1964. Her nephew Otto Frisch composed the inscription on her headstone. It reads "Lise Meitner: a physicist who never lost her humanity". A short residential street in the village is named "Meitner Close". On a visit to the USA in 1946, she received the honour of "Woman of the Year" by the National Press Club and had dinner with President Harry Truman and others at the Women's National Press Club. She lectured at Princeton, Harvard and other US universities, and was awarded a number of honorary doctorates. She received jointly with Hahn the Max Planck Medal of the German Physical Society in 1949, and in 1955 she was awarded the first Otto Hahn Prize of the German Chemical Society. In 1957 the German President Theodor Heuss awarded her the highest German order for scientists, the peace class of the Pour le Mérite. She was nominated by Otto Hahn for both honours. Meitner's name was submitted, also by Hahn, to the Nobel Prize committee more than ten times, but she was not accepted. Meitner was elected a foreign member of the Royal Swedish Academy of Sciences in 1945, and had her status changed to that of a Swedish member in 1951. Four years later she was elected a Foreign Member of the Royal Society (ForMemRS) in 1955. She was elected a Foreign Honorary Member of the American Academy of Arts and Sciences in 1960. In 2000, the European Physical Society established the biannual "Lise Meitner Prize" for excellent research in nuclear science. In 2006 the "Gothenburg Lise Meitner Award" was established by the University of Gothenburg in Sweden; it is awarded annually to a scientist who has made a breakthrough in physics. In 2008, the NBC defense school of the Austrian Armed Forces established the Lise Meitner Award. In October, 2010, a building at the Free University of Berlin was named the Hahn-Meitner Building; this was a renaming of a building previously known as the Otto Hahn Building. In July 2014 a statue of Lise Meitner was unveiled in the garden of the Humboldt University of Berlin next to similar statues of Hermann von Helmholtz and Max Planck. Schools and streets were named after her in many cities in Austria and Germany. ↑ "Lise Meitner | Biography". atomicarchive.com. 27 October 1968. Retrieved 9 April 2012. 1 2 3 Frisch, O. R. (1970). "Lise Meitner. 1878–1968". Biographical Memoirs of Fellows of the Royal Society. 16: 405–426. doi:10.1098/rsbm.1970.0016. 1 2 Meitner, L.; Frisch, O. R. (1939). "Disintegration of Uranium by Neutrons: A New Type of Nuclear Reaction". Nature. 143 (3615): 239. Bibcode:1939Natur.143..239M. doi:10.1038/143239a0. . Meitner is identified as being at the Physical Institute, Academy of Sciences, Stockholm. Frisch is identified as being at the Institute of Theoretical Physics, University of Copenhagen. 1 2 3 "Lise Meitner Dies; Atomic Pioneer, 89. Lise Meitner, Physicist, Is Dead. Paved Way for Splitting of Atom.". The New York Times. 28 October 1968. Retrieved 18 April 2008. Dr. Lise Meitner, the Austrian born nuclear physicist who first calculated the enormous energy released by splitting the uranium atom, died today in a Cambridge nursing home. She was 89 years old. 1 2 Crawford, Elisabeth; Sime, Ruth Lewin; Walker, Mark (1997). "A Nobel Tale of Postwar Injustice". Physics Today. 50 (9): 26–32. Bibcode:1997PhT....50i..26C. doi:10.1063/1.881933. 1 2 Perutz, Max F. (2002). "Splitting the Atom". I Wish I'd Made You Angry Earlier: Essays on Science, Scientists, and Humanity. p. 27. ISBN 9780879695248. OCLC 37721221. Originally published as book review; see Perutz, Max (20 February 1997). "A Passion for Science". The New York Review of Books. (subscription required (help)). ↑ Judson, Horace Freeland (20 October 2003). "No Nobel Prize for Whining". The New York Times. Retrieved 3 August 2007. 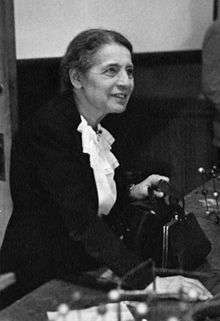 Lise Meitner, the physicist first to recognize that experiments reported by two former colleagues in Berlin meant that atoms had been split, never got a prize, even though one of those colleagues, Otto Hahn, did in 1944. ↑ "Otto Hahn, Lise Meitner and Fritz Strassmann". Chemical Heritage Foundation. Retrieved 27 October 2016. 1 2 3 4 5 6 Bartusiak, Marcia (17 March 1996). "The Woman Behind the Bomb". The Washington Post. ↑ Westly, Erica (6 October 2008). "No Nobel for You: Top 10 Nobel Snubs". Scientific American. ↑ "Associated Papers of Lise Meitner". Janus. Retrieved 8 January 2008. ↑ Cornwell, John. Hitler's Scientists: science, war and the devil's pact. Viking 2003. p. 66. ISBN 0-670-03075-9. OCLC 52761187. ↑ "Lise Meitner and Nuclear Fission". Orlandoleibovitz.com. Retrieved 9 April 2012. ↑ Meitner was said to be inspired by her teacher, physicist Ludwig Boltzmann, and was said to often speak with contagious enthusiasm of his lectures. ↑ Drezgic, Marija. "Lise Meitner | Famous Women in Physical Sciences and Engineering". bnrc.berkeley.edu. Retrieved 2016-10-28. ↑ "Lise Meitner | Jewish Women's Archive". jwa.org. Retrieved 2016-10-28. ↑ Kerner, Charlotte (1999). Lise, Atomphysikerin. Die Lebensgeschichte der Lise Meitner [Lise, Atomic Physicist. The Life Story of Lise Meitner.] (in German) (second ed.). Weinheim: Verlag Beltz & Gelberg. ISBN 978-3-407-78812-2. OCLC 612209107. Second edition of a 1986 book for secondary school students. ↑ Meitner, L. (1922). "Über die Entstehung der β-Strahl-Spektren radioaktiver Substanzen". Zeitschrift für Physik. 9: 131–144. Bibcode:1922ZPhy....9..131M. doi:10.1007/BF01326962. ↑ Auger, P. (1923). "Sur les rayons β secondaires produits dans un gaz par des rayons X" [On the secondary β-rays produced in a gas by X-rays]. Comptes rendus hebdomadaires des séances de l'Académie des science (in French). 177: 169–171. ↑ Meitner published before Auger, but the effect does not bear her name. The issue of whether Meitner's name should have been included is examined in: Duparc, Olivier Hardouin (2009). "Pierre Auger – Lise Meitner: Comparative contributions to the Auger effect". International Journal of Materials Research. 100: 1162–1166. doi:10.3139/146.110163. ...the Auger effect has rightly been attributed to Auger. ↑ Rhodes, Richard (1995). The Making of the Atomic Bomb. Simon & Schuster. pp. 159–161. ISBN 9781439126226. ↑ Rhodes, Richard (1995). The Making of the Atomic Bomb. Simon & Schuster. p. 233. ISBN 9781439126226. 1 2 Lise Meitner: Recollections of Otto Hahn. S. Hirzel, Stuttgart, 2005. ↑ O. Hahn and F. Strassmann Über den Nachweis und das Verhalten der bei der Bestrahlung des Urans mittels Neutronen entstehenden Erdalkalimetalle (On the detection and characteristics of the alkaline earth metals formed by irradiation of uranium with neutrons), Naturwissenschaften Volume 27, Number 1, 11–15 (1939). The authors were identified as being at the Kaiser-Wilhelm-Institut für Chemie, Berlin-Dahlem. Received 22 December 1938. ↑ Sime, Ruth Lewin. Lise Meitner: A Life in Physics University of California Press, 1996, p. 305. ISBN 9780520089068. OCLC 32893857. ↑ "The Nobel Prize in Chemistry 1944". Nobel Foundation. Retrieved 26 August 2011. ↑ Letter to B. Broomé-Aminoff in November 1945; see Hardy, Anne; Sexl, Lore (2002). Lise Meitner. Rowohlt Verlag. p. 119. ISBN 3-528-08934-2. ↑ "Nomination Database: Otto Hahn". Nobelprize.org. ↑ "Nomination Database: Lise Meitner". Nobelprize.org. ↑ Otto Hahn: My Life.Preface by Sir James Chadwick. Macdonald & Co., London, 1970. American edition: Herder and Herder, New York 1970. ↑ "Book of Members, 1780–2010: Chapter M" (PDF). American Academy of Arts and Sciences. Retrieved 29 July 2014. ↑ Dietrich Hahn (Ed. ): Otto Hahn – Eine Biographie in Bildern und Dokumenten. List, Munich 1979. p. 334.ISBN 3-471-77841-1. ↑ Hahn, Otto (13 December 1946). "From the natural transmutations of uranium to its artificial fission. Nobel Lecture." (PDF). Nobel Foundation. Retrieved 24 September 2007. ↑ Hardy, Anne (4 March 2004). "Otto Hahn – Entdecker der Kernspaltung" (in German). Pro Physik, Wiley Interscience GmbH. Retrieved 24 September 2007. ↑ "EPS Nuclear Physics Division - Lise Meitner Prize". European Physical Society. Retrieved 12 December 2015. ↑ "Gothenburg Lise Meitner Award". Chalmers University of Technology. Retrieved 12 December 2015. ↑ Neukam, Viola (28 October 2010). "'More than Just a Name Change': Freie Universität Renames Otto Hahn Building as Hahn-Meitner Building". Freie Universität Berlin. ↑ Herbold, Astrid (9 July 2014). "Große Physikerin, späte Ehrung" [Great Physicist, Belated Honour]. Der Tagesspiegel (in German). ↑ "Lise Meitner Gymnasium Hamburg: Schule/Home". www.hh.schule.de. Retrieved 2016-03-05. ↑ "Lise-Meitner-Gymnasium". hp.lise-meitner-gymnasium.de. Retrieved 2016-03-05. Goldberg, Stanley (July 1996). "With friends like these ....". Bulletin of the Atomic Scientists. pp. 55–57. Contemporaneous review of Ruth Lewin Sime's biography of Meitner. Meitner, Lise (2005). Hahn, Dietrich, ed. Erinnerungen an Otto Hahn [Recollections of Otto Hahn] (in German). Stuttgart: S. Hirzel. ISBN 978-3-7776-1380-2. OCLC 180889711. Sime, Ruth Lewin (2006). "Lise Meitner". In Byers, Nina; Williams, Gary. Out of the Shadows: Contributions of 20th-Century Women to Physics. Cambridge University Press. Sime, Ruth Lewin (2005). "From Exceptional Prominence to Prominent Exception: Lise Meitner at the Kaiser Wilhelm Institute for Chemistry" (PDF). Geschichte der Kaiser-Wilhelm-Gesellschaft im Nationalsozialismus. Retrieved 2015-11-26. For the first twenty years, hers is an expansive story of a woman who achieves exceptional prominence in physics; after 1933 her story gradually narrows until nothing is left for her as a person of Jewish origin in Germany. Sime's article is the 24th publication in the series History of the Kaiser Wilhelm Institute under National Socialism.